The initiative comes out of a larger project cataloguing programs that plague people with unwanted ads, spy on web habits or steal personal data. Google is one of several companies trying to act as an "in-flight adviser" to ensure people stay safe online. The warnings will be seen by anyone using the search engine who clicks on a link to a site identified as harmful by the Stop Badware coalition. Google, PC maker Lenovo and Sun set up this initiative in January 2006 to identify dangerous software and the websites that try to trick people into installing these malicious programs. Initially the warnings seen via the search site will be generic and simply alert people to the fact that a site has been flagged as dangerous. Eventually the warnings will become more detailed as Stop Badware researchers visit harmful sites and analyse how they try to subvert users' machines. 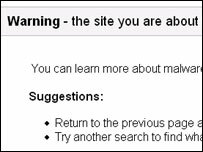 The warning suggests that people try a different site but if they want to continue to the potentially dangerous webpage Google will not stop them. A research report released in May 2006 looked at the safety of the results returned by a search and found that, on average, 4-6% of the sites had harmful content on them. For some keywords, such as "free screensavers" the number of potentially dangerous sites leapt to 64%. The keywords are used to entice people to access the website. The research report was partly sponsored by McAfee's SiteAdvisor which also warns people when they are about to visit potentially harmful sites. Another company ScanSafe has also created the Scandoo search engine which overlays its warnings on results produced via Google and MSN. "Most dodgy websites that have spyware or are infected with viruses come through search," said Eldar Tuvey, chief executive of ScanSafe. "Because they are the ones that people do not know as well and find through searching."